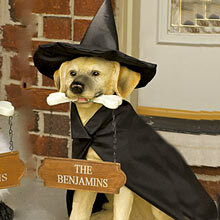 I’ve Finally Found It… Adorable Doggie Yard Art! You may recall that I’ve had my eye out for that perfect one-of-a-kind figurine or statue to grace the front porch of our new log home. Since I don’t want anything too “tacky”, I honestly didn’t think I’d ever be able to find something cute, fun, and classy. This Dog Changes With The Seasons! Just like the fashionable porch pig mentioned above, these dog statues can be dressed up with dog clothes and seasonable costumes! I know, I know… it’s borderline goofy. But done just right, I think it could work. 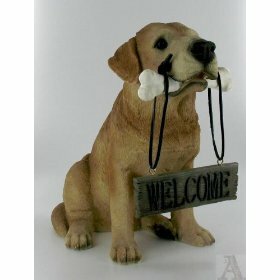 In case you’re wondering, these Dog Welcome Statues are 20 inches high and they’re handcrafted of resin and metal for year-round durability. 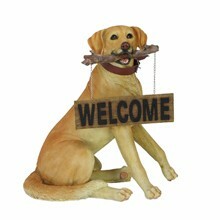 The sign can be engraved with any message on 2 lines, up to 10 characters per line. 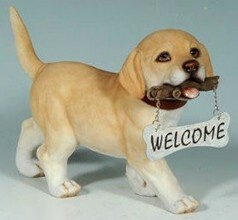 The cost is $39.95 from PersonalCreations.com. 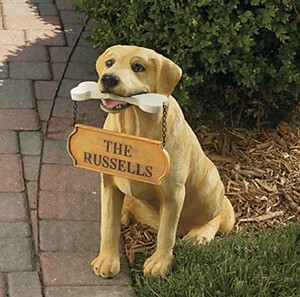 UPDATE: It looks like that one’s no longer available, so here’s a similar dog statue from Lowes. I’ll let you know if we decide to go this route… but to be honest, porch critters are barely a blip on the radar at this stage of the game. Most pressing on our minds right now are things like: the closing date… those outrageous excavation costs… and metal vs architectural shingles. You know, things like that. 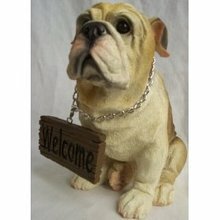 If this dog statue were a little bit taller (it’s only 10 inches high), it would be completely adorable on the porch of our new log home! 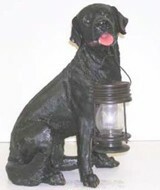 The fact that the dog is holding a lantern in its mouth is just too cute… and very unique.